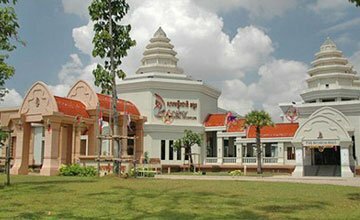 Tours outside Siem Reap that’s mean tour will go outside from Siem Reap Province and take every long driving as the tour will be started in very early morning and finished in evening when we return to your hotel. 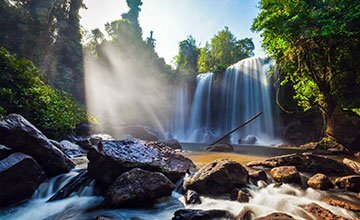 Battambong city/Province : Located on the Norwest Side of Cambodia and is the fifth largest province of Cambodia. The province’s fertile rice fields have led to a mostly agricultural economy giving rise to the moniker “the Rice Bowl of Cambodia”. The province features a range of cultures as well as natural resources. Seventy five percent of the area is jungles and mountains. We will drive around to the city but this city not so big or modern if we compare with city of Siem Reap & Phnom Penh. NEW Bamboo Train A reinvention of the famous bamboo rattler has been completed 500 metres from Wat Banan. The old track was closed in October 2017 to make way for the renovation of the state railway. Phnom Sampou An important religious site known throughout all Cambodia Phnom Sampov is a striking limestone mountain located on the road to Pailin about 12 km from Battambang. Like Wat Banan there are a series of steps leading up the mountain although an easier route up is on the back of a motorbike via a new road. On the top of the hill is a Wat and many stupas along with various shrines and grottos. During the Khmer Rouge period the mountain was used as a place to kill “enemies” of the regime and in what are known as the “killing caves” there is a memorial to these victims. Also on the mountain are two rusting artillery pieces which were used by the Cambodian government and their Vietnamese allies in the fight against the Khmer Rouge which ended in 1996. Although Phnom Sampov has a tragic past it is also a pleasant place to visit. The panoramic views from the top are truly breathtaking and there are a variety of food and drink stalls at the base of the mountain making it a great place to while away the hours. Every evening at nightfall thousands of bats make their way out of caves in the hillside to feed before returning at dawn. This natural phenomenon really is a “must see” for the visitor. Phnom Banoun Phnom Banan is some 22 kilometres to the south of Battambang, but worth a visit if you’ve time to spare. Like Ek Phnom, Banan is also originally 11th century-built, though it saw a Buddhist makeover during the 12th century and reign of Jayarvarman VII. The temple is constructed on top of a hill overlooking the Sangkar river and there’s a 358-step climb to the top, where five towers precariously remain. Wat Ek Phnom is an angkorian temple located on the left bank of the Sangkae River near the G Peam Aek spot approximately 13 km north of the city of Battambang in north western Cambodia. 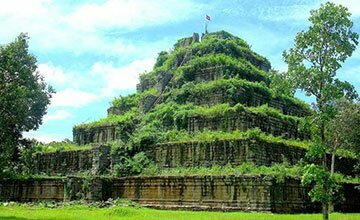 It is a Hindu temple built in the 11th century under the rule of king Suryavarman I. Although partly collapsed and looted it is famous for its well-carved lintels and pediments.